SCMPD says that traffic will be rerouted on several downtown streets in preparation for Savannah State University’s 2017 Homecoming Parade, set for Saturday, Oct. 7. The parade begins at 9 a.m., and enforced no-parking zones will take effect as early as 12:01 a.m., police say. The staging area is on East Broad Street, and runs from Gwinnett to Liberty streets. The parade begins on Broad Street at Liberty, then travels north to Oglethorpe Avenue, west to Price Street, north to Broughton Street, west to Martin Luther King, Jr. Boulevard and then disbands on Anderson Street. "This event will impact Downtown traffic flow as well as residential and visitor parking. 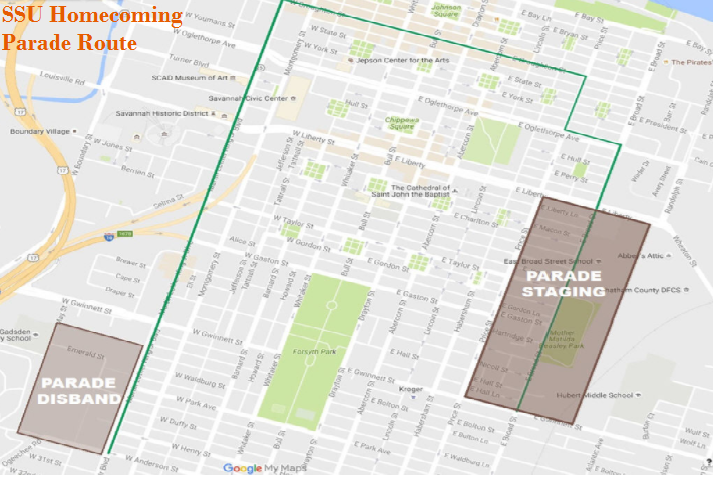 Parking will be impacted within the staging area and along the parade route," police say. "No parking zones will be marked prior to the parade. Notices will be posted in impacted areas throughout the rest of the week. Vehicles remaining in no parking zones after the indicated times will be towed at the owner’s expense," police report. Police say that congestion is expected to be very heavy until after 1 p.m. "SCMPD asks that drivers plan routes accordingly and exercise caution and patience during this event."